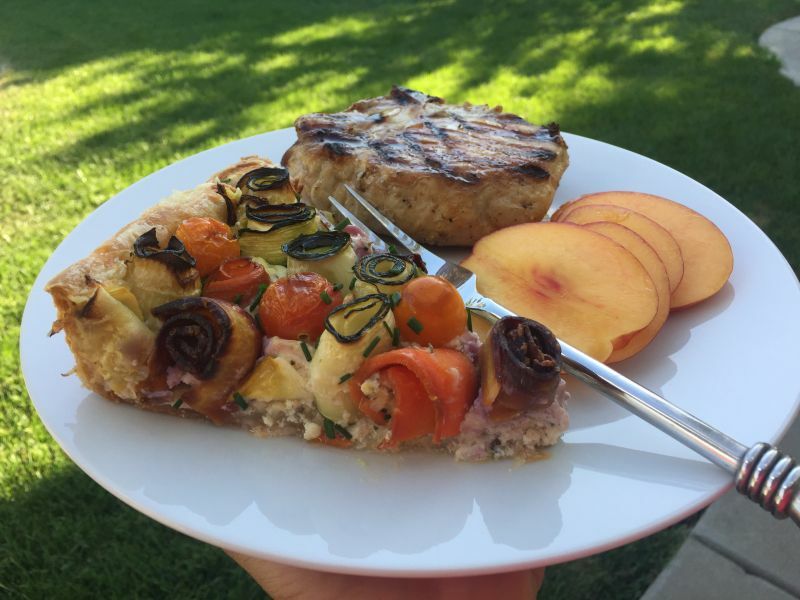 California Girl Comments: This is the most gorgeous recipe that Ms. April has ever produced for our blog. Get ready to print this one out, because your guests will be wowed. She amazes me every single week with her creations, but this week I think her recipe is extra special. What this weeks’ recipe ended up being was a way to use up the leftovers from making previous meals. I had puff pastry from the Onion and Blue Cheese Puffs and the tomatoes from the Savory Tomato Tart just screaming to be put to good use! Add to that some eggs, cheese, seasonings….I may have something here! 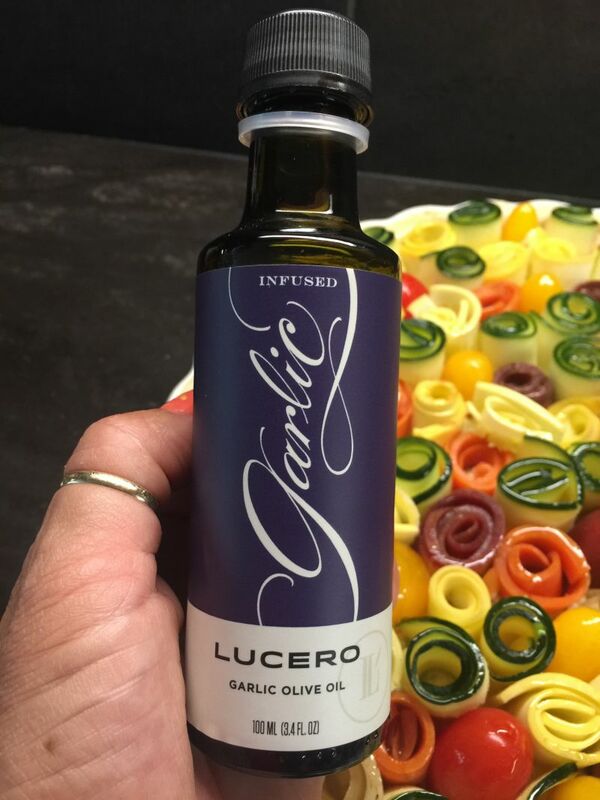 I also recently received a gift containing a delicious garlic infused olive oil from Lucero Olive Oil Company, in Corning, California. It is California’s most awarded Olive Oil, and I was anxious to use it! If you are traveling up in Northern California, Corning is right off of Interstate 5 and Lucero is a wonderful stop! They have olive oils, balsamic vinegar and other tasty treats you will enjoy sampling and taking home with you! A couple years ago, my daughter Sarah gave me a lovely mandolin. 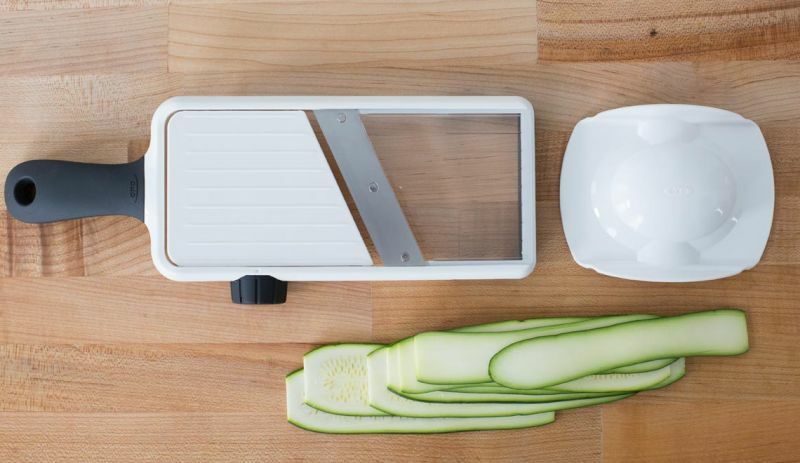 Not the musical variety, but the kind that slices vegetables to various thicknesses. This recipe will use the mandolin, or you can hand slice the vegetables. The mandolin will make it much easier and the vegetables will be more uniform. It’s a handy gadget to keep in the back of your cupboard! Remember that beautiful tart pan I treated myself to at IKEA? It is certainly becoming a regular on our dinner table, and this recipe is going to use it again. 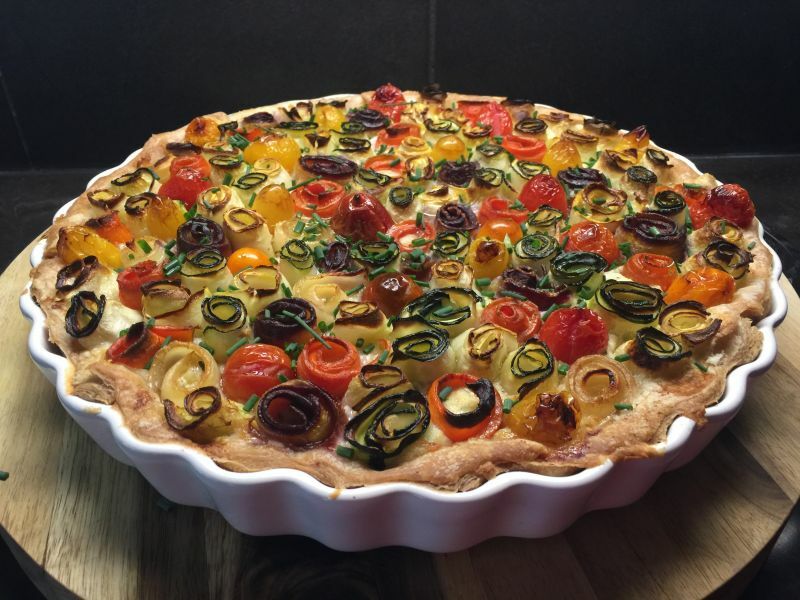 If you don’t have a tart pan, use a pie pan or even a shallow casserole dish. It will all work. Spray the pan with non-stick spray and set it aside. Preheat the oven to 375 degrees. 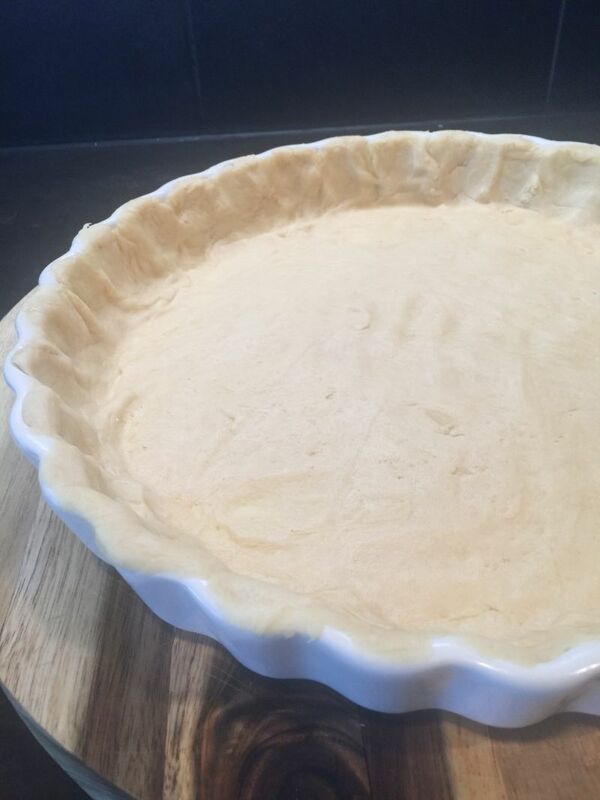 Line the prepared tart or pie pan with puff pastry and using a sharp knife, cut the extra from around the top of the pan. If using a pie pan, you can finish the edge as you would a regular pie. Set aside. Using the mandolin, cut long thin slices of zucchini, yellow squash and carrots. Be extremely careful and use the guard so you don’t cut yourself! 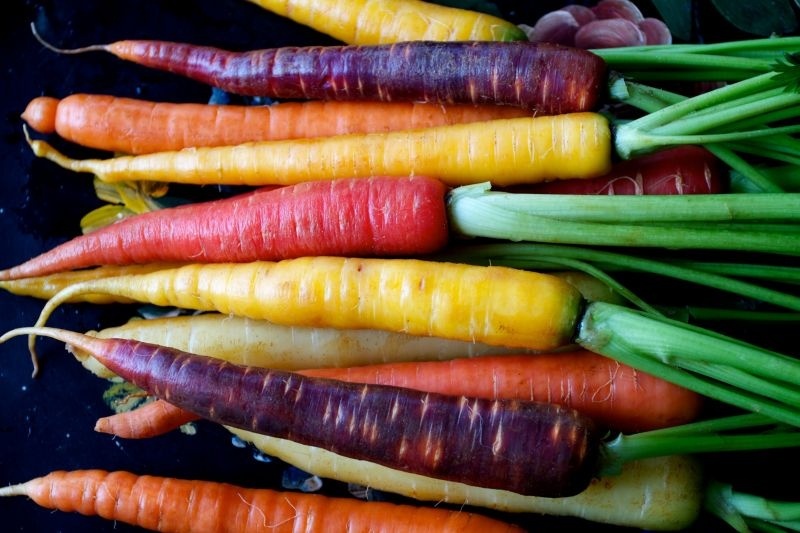 Separate the squash from the carrots, and on a microwave safe plate or paper plate, cook the carrot slices in the microwave a minute at a time until they are pliable. This took 2 minutes in my microwave. 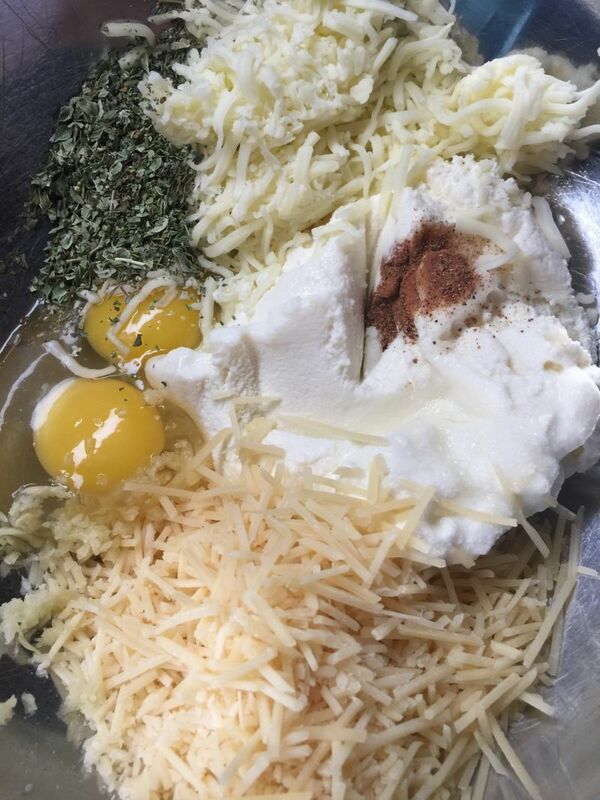 In a mixing bowl, combine the cheeses, eggs, garlic, nutmeg, oregano, salt. Using a rubber spatula, fold it all together. 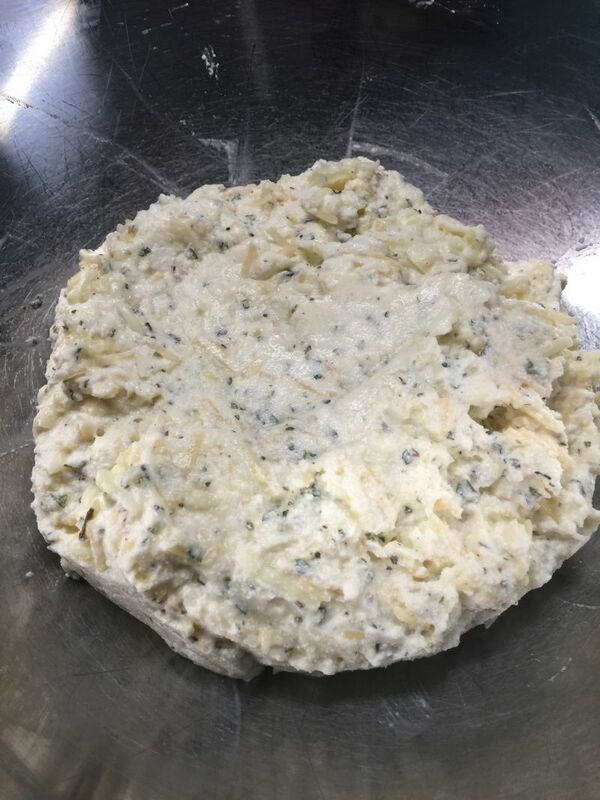 Put this mixture into your prepared crust and spread evenly. 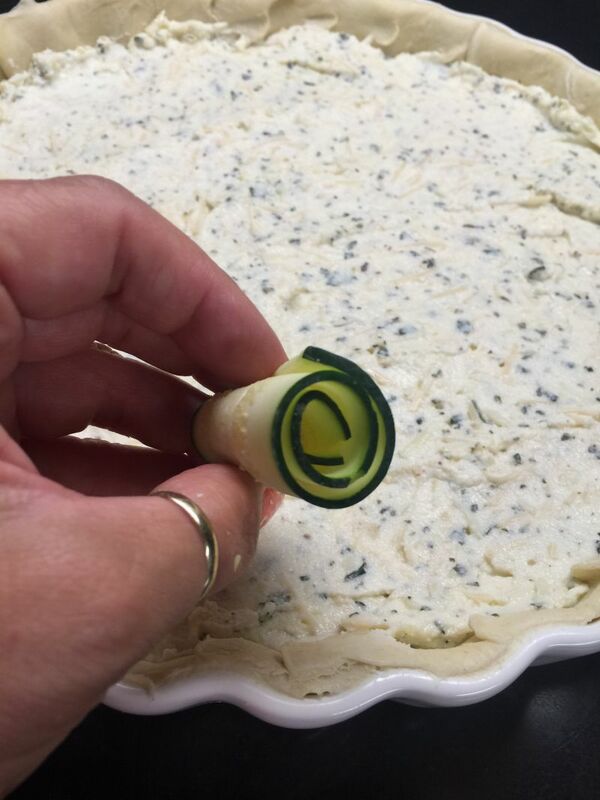 Begin with squash, and roll a slice into a flower shape, starting at one end of the slice. It should be thin enough to roll easily. Place in the prepared mixture, starting at the edges, and gently press the rolled vegetable into the cheese mixture. Alternate squash and different colors of carrots and repeat this process until the cheese mixture is covered, occasionally adding a cherry tomato as you go. If you have smaller pieces of carrots or squash, just add another piece and continue rolling until you get the right size. These rolls will resemble flowers! Don’t worry if the slice breaks when you first start rolling it. Just keep going and as it gets larger, the slice of vegetable will roll nicely. 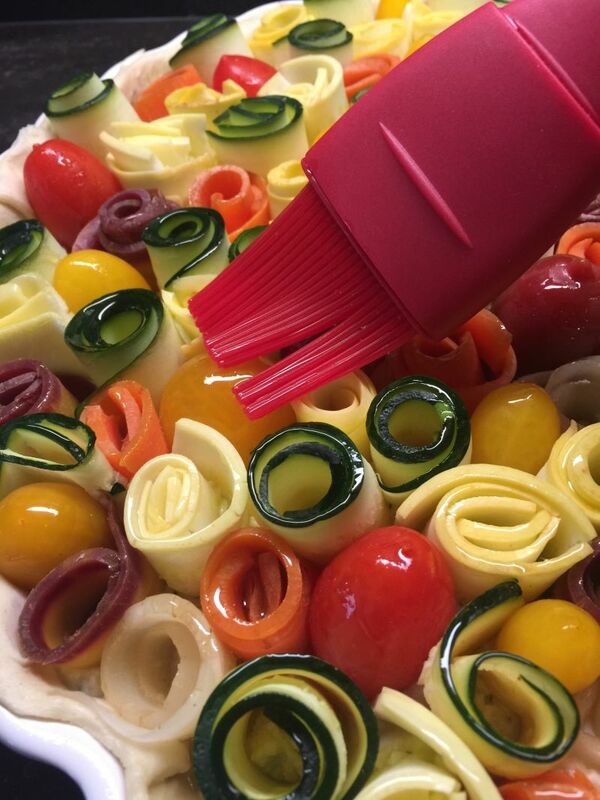 Brush the entire top of the tart with garlic infused olive oil, and bake in a 375-degree oven for 50-60 minutes, or until it is bubbly and lightly browned and the puff pastry is brown as well. Allow to cool slightly, and garnish with chopped chives before serving. This recipe is a little time consuming, but you will truly feel like an artisan when it is finished. It’s not only beautiful but tastes amazing! It has an Italian feel with the 3 kinds of cheese and the subtle flavor of oregano. 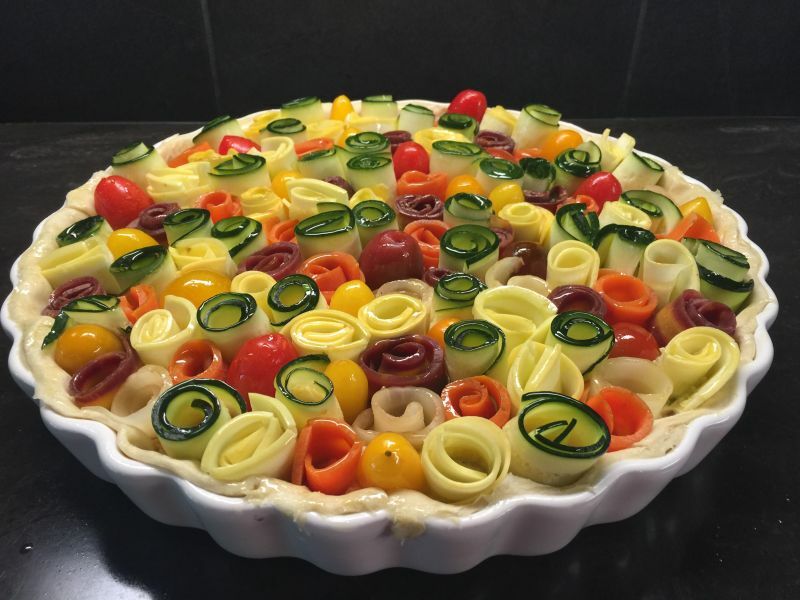 The name of the dish is Italian as well, and means simply, “Tart of Vegetables.” I hope you enjoy! California Girl Comments: See what I mean? Wow, just wow! For this week’s wine pairing I really wanted to suggest a fancy expensive wine to go with this beautiful dish. Instead, I am choosing a wine that is affordable, that your guests will think you spent a fortune on! 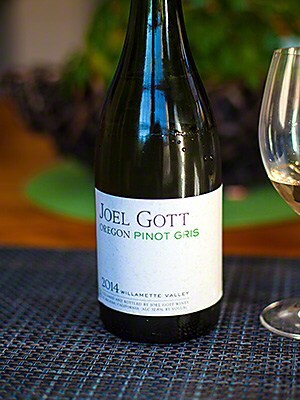 I chose Joel Gott’s, Pinot Gris. At $14.99 a bottle, it won’t break the bank. The reason I chose this wine is that the texture is light and refreshing but it has enough flavor to hold up to the cheese without overwhelming the delicate flavors of the vegetables. Let us know if you agree!